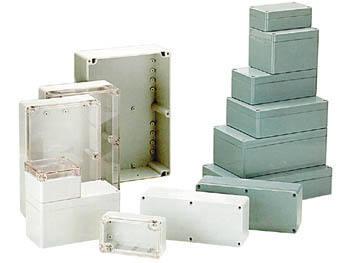 SEALED POLYCARBONATE BOX - LIGHT GRAY 4.5" x 2.6" x 1.6"
These enclosures consist of polycarbonate (operating temperature : -40°F to +257°F). The lid and the base are equipped with a tongue and groove sealing system with a neoprene gasket. The mounting holes and the lid-fixing screws are outside the sealed area, which prevents moisture and dust from entering the enclosure. Internal guide slots allow the vertical mounting of PCB assemblies. Designed to meet IP65 of IEC529 and NEMA4 (dust- and hoseproof). The bosses on the internal base allow the horizontal fixing of PCBs or the connection of terminals, etc. with threaded brass inserts. Notify me of updates to SEALED POLYCARBONATE BOX - LIGHT GRAY 4.5" x 2.6" x 1.6"